Exclusive Personalized Pre-Season Training Camp with On The Run Coaching Services and Fundy Sports & Tourism. Are you looking to improve your triathlon performance? Do you want an opportunity to get away from the harsh Canadian winter? Are you looking for professional help with your Program plan? Do you want to work with a small group of like-minded athletes and a 3 to 1 ratio of camp staff to athlete? Would you like an early season triathlon race – Sprint and Olympic Triathlon. My First Triathlon, Sprint and Olympic Duathlon & Relays? Then this is the Camp for you. Coached Workouts: Daily coached workouts each morning, including a swim at the National Training Center’s outdoor 50 meter pool and world class running track. Individual Reviews: Stroke analysis and running analysis for each athlete. We will gather in the evenings for social time on the deck and a review of the day’s videos. Season planning: We will work together to help you develop a detailed plan for the coming season. Hiking: We will offer a guided hike of the amazing Lake Louisa State Park, the trails are awesome and the plants and wildlife fascinating. 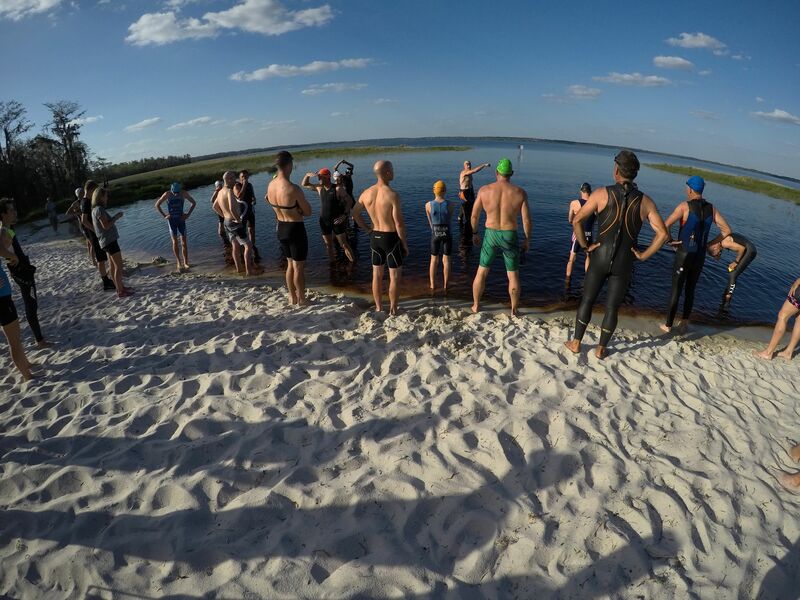 Racing: We will have an opportunity to race an early season triathlon within Lake Louisa State Park – options include a Sprint Tri, Olympic Tri, Relay, Sprint Duathlon, Olympic Duathlon or for first timers, My First Triathlon. Relaxation: Most afternoons will be all yours to explore the park, paddle a kayak, go horseback riding or just kick back on the screened in porch and enjoy the peace of the Park. Q&A sessions – your opportunity to ask us anything about training, racing, organizing around a Campfire beside our cabins. Our Camp staff have a wealth of knowledge and experience gained through years and years of racing, coaching, training, traveling and organizing events. We have Daryl Steeves, the leading Triathlon/Running coach in the Maritimes, Ellen Steeves, our expert administrator and and multiple triathlon finisher, distance swimmer & Ultra finisher, Helena Millar our travel professional extraordinaire who has competed in 2 Half Iron Distance events in the last year and Garth Millar, multiple Ironman finisher, Marathon runner, Cyclist and race organizer of the 2 largest triathlons in Atlantic Canada – The Hampton Ladies Triathlon and Rev3 St Andrews. Whether you are new to Triathlon, looking to PR a 5k, aspire to qualify for Boston, want to finish your first triathlon or complete a lifetime ambition to take part in an Ironman this Camp will help you develop the skills and tools necessary to achieve your goals in a friendly, no-pressure environment where the focus is on your personal development. Accommodations in 1 of 3 cabins in Lake Louisa State Park – prices based on 4 people sharing 1 cabin. Transfers from the park to the National Training Centre for swimming and track running. Coached sessions and video analysis. Expert support staff to help you gain the most from your Camp experience. Run on part or all of the 10 mile Clay Roads adjacent to Lake Louisa State Park. Access to a triathlon based in Lake Louisa State Park. Pre & post race analysis. Airport transfers* on Wednesday 20 March – return Wed 27 March – for camp participants and luggage only (we will not be able to transfer bikes) *at designated times only, please contact Helena prior to booking flights. Flights – please contact Helena on 506 214 1085 for assistance with flight bookings and timings to coincide with Camp. Personal Travel Insurance – Medical & Cancellation quotes can be provided by us through our relationship with Manulife. Individual Car Rental if required. Minimum of 8 confirmed people required for Camp to operate. Lake Louisa State Park – A short drive from Orlando, this 4,500-acre state park is noted for its beautiful lakes, rolling hills and scenic landscapes. Accommodation – Prices are based on 4 people sharing a 2 bedroom, 2 bathroom cabin = $999.00 CAD per person. Lake Louisa State Park’s 20 cabins overlook beautiful Dixie Lake. The cabins accommodate up to six people and have two bedrooms, two baths, full kitchen (with appliances) and dining/living room. Each cabin comes equipped with Central Heat/Air Conditioning, gas fireplace, dishes, pots and pans, silverware, linens, towels, picnic tables and rockers on the porch. All you need to bring is your food and personal items. To conserve energy, the fireplaces are out of service from March 1st to October 31st (or as seasonal weather permits). Televisions and phones are not provided.